We started reviewing the last 6 months from many aspects to point out interesting trends and predict further development. 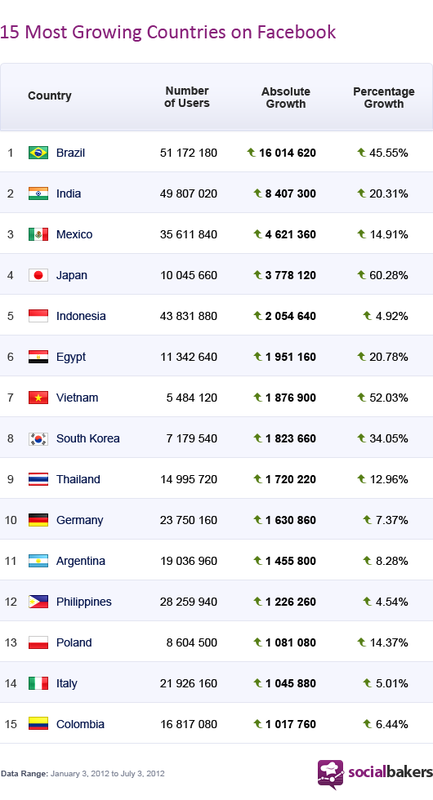 These are the 15 fastest growing Facebook countries in the world! The Facebook statistics for the first 6 months in 2012 revealed some less and more suprising trends! As we predicted, the growth is moving from West to East as Asia gradually makes it´s way to the continent with the biggest Facebook population. But we didn´t expect to see only 3 European countries in the Top 15 since its the biggest Facebook continent. And we are surprised that the United States finished in negative numbers and placed last (213th place) after losing almost 2 million Facebook users during the last 6 months! Brazil, India and Mexico are currently the fastest growing Facebook countries! In March, we informed you about Brazil´s rapid growth and its potential to move from the 4th to 2nd biggest Facebook country. As you can see from the growth table and the overall ranking below, Brazil met the expectations and is now second just behind the United States. According to our statistics, it gained more than 16 million Facebook users in the last 6 months. That´s an incredible 45, 55% increase! As we predicted, Asia became the second biggest Facebook continent surpassing the number of users in North America. It is becoming stronger thanks to growing penetration in Indonesia, the Philippines, Thailand, Vietnam, South Korea and Japan! But Asia´s main flagship country is India gaining over 8 million new Facebook users and growing by 20, 30% in the last 6 months! Egypt grew by 20, 73% and ranked 6th in the fastest growing ranking. Germany is the fastest growing Facebook country in Europe. It gained over 1, 6 million new Facebook users and now has a total population of almost 24 million! Poland and Italy are also in the Top 15 making Europe proud! Don't forget, you can always find fresh statistics in our Facebook statistics section on top for not only fresh stats on countries, but also on Facebook pages, and more! P.S. : Don´t forget to save the date for the upcoming Engage 2012 event taking place October 23rd in New York City! Find out more here. Get unique inside into the top countries with the fastest user growth on Facebook – brought to you by Socialbakers. Yesterday, Facebook announced that it has 901 million users which immediately triggered estimations on when it will reach the biggest milestone: 1 billion users!